ML Humanes et al (2013): “Pluralism and political parallelism in Spanish television news programmes”, at Revista Latina de Comunicación Social. [EN] Introduction: This article has two main objectives. Firstly, it attempts to determine whether the news content of the mainstream Spanish television channels is governed by external pluralism which is a distinguishing feature of the polarised-pluralist media system, as exposed by Hallin and Mancini. The second objective is to address the relation that exists between pluralism and political parallelism. Methods: The study is based on the content analysis of a sample of 3,134 news items broadcast by the prime time news programmes of six national television networks: TVE1, Antena 3, Telecinco, La Sexta, Cuatro and Intereconomía. Results: The Spanish model of television is hybrid and combines different degrees of internal and external pluralism depending on the network’s profile and the media group’s business strategy. The news programmes produced by the public television channels exhibit the highest levels of internal pluralism. [EN] pluralism; political parallelism; news; digital terrestrial television; Spain. [EN] 1. Introduction. 1.1. External and internal pluralism. 1.2. Pluralism and political parallelism. 2. Objectives and hypotheses. 3. Methods. 4. Results. 4.1. Internal and external pluralism of information. 4.2. Pluralism of information and political parallelism. 5. Conclusions. 6. List of references. Based on these premises, the purpose of this article is to analyse the relation between information pluralism and political parallelism in Spanish digital terrestrial television. First of all, we will try to determine whether the news content of the mainstream television channels is governed by external or internal pluralism. Secondly, we will specifically focus on the relation between pluralism and political parallelism proposed by Hallin and Mancini (2004). This study about the news patterns of Spain’s digital terrestrial television is based on the content analysis of the daily news programmes of the national mainstream TV networks. Pluralism guarantees that citizens have free access to information that represents all points of view and, consequently, allows them to develop an independent opinion. For this purpose, there are two types of pluralism which, a priori, guarantee the freedom of information: internal and external pluralism. External pluralism refers to the diversity of media organisations and the contents that express the different points of view of a society. This means that pluralism emerges from the variety of companies (public or private), media (printed, broadcast, digital, etc.) and contents that express different editorial lines. On the other hand, internal pluralism occurs within each media organisation, and refers to the diversity of points of view that are included in the news content of each media organisation and reflect the search for neutrality, content balance, and cultural diversity. The relation between internal and external pluralism raises a debate of interest to academics and politicians, who have reached different conclusions. Some promote external pluralism as the best guarantor of the quality of the democratic system, while others propose the exact opposite. However, most academic and politicians agree that public television channels must guarantee internal pluralism, i.e. the pluralism of content, in order to fulfil their public service function. At the same time, commercial channels seem to guarantee external pluralism because of the diversity of ownership (Czepek and Klinger, 2010). A conceptual contribution to the definition of both types of pluralism was made by the Council of Europe (1994) in its fourth European Ministerial Conference on mass communication policy in a democratic society: “Pluralism can be internal, across a wide range of values, opinions, news stories and interests that find a vehicle of expression in the bosom of a particular media sector, or external through some of these bodies, each of them expressing a particular point of view”. In Spain, the Audiovisual Communication Law establishes, in article 4, that “all people have the right to receive audiovisual communication through a variety of public, commercial and community-oriented media that reflect the ideological, political and cultural pluralism of society”. However, in article 10, this law states that “audiovisual communication service providers have the right to set their editorial line through the selection of contents and schedules”. Thus, private broadcasters contribute to pluralism with the mere existence, which reinforces external pluralism, while public (regional and national) television channels must develop internal pluralism (Preamble and article 40). The analogue to digital switchover opened new expectations of plurality in the television sector. Political leaders and digital technology experts predicted new possibilities for the public service, increased internal and external pluralism and greater cultural diversity. However, this has not happened. The implementation of the EU guidelines and policies on digital television in most of the member states has reinforced the logic of the market (Bustamante, 2008). In Spain, the regulation of digital terrestrial television (DTT), which was established by the Socialist Government of José Luis Rodríguez Zapatero, expanded the number of programmes and favoured the entry of new television groups, some of which were close to the Socialist project, like Mediapro. These changes resulted in the weakening of the public sector and the strengthening of the Mediaset and Planeta groups which reinforced their dominance through Telecinco and Antena 3 (Bustamante and Corredor, 2012; Zallo, 2010). The promised abundance of channels should have strengthened external pluralism, but instead the development of the sector has favoured the concentration of large media groups. In this context, it is particularly interesting to examine whether the news production is governed by internal or external pluralism, which is the first objective of this article (H1). In its origins, the term parallelism, proposed by Seymour-Ure (1974), made reference to the relation between political parties and the press, and took into consideration the ownership of newspapers, the editorial point of view and the affiliation of readers. Subsequently, the term political parallelism covered a broader set of relations between political parties and the media in general (Blumler and Gurevitch, 1995). Hallin and Mancini (2004) defined the concept of political parallelism in line with the broader vision of Blumler and Gurevitch (1995) and proposed the following areas to analyse it: the media content, the organisational relations between the media and the political parties, the political affiliations of journalists and the partisanship of the audiences. The relation between pluralism and political parallelism in the Spanish media fits, in general terms, the polarised pluralist model described by Hallin and Mancini (2004): external pluralism, interpretive journalism, governmental control over the management of public audiovisual media, and state intervention in the regulation of the audiovisual media through the licensing system. In Spain, studies on print journalism have revealed a system with a strong political parallelism and a resulting predominance of external pluralism. Strömbäck and Luengo (2008) point out that one of the most important differences between the election news coverage in Sweden and Spain is precisely that in Spain the focus is placed on the political actors and fundamentally the political parties. Van Dalen (2012) carried compared political journalists from Denmark, Great Britain, Germany and Spain and found out that the Spanish journalists considered that they did not to assume the role of adversaries but adopted a partisan position. Mazolleni affirms that this adversarial model is unlikely to be found in media systems where there is certain misunderstanding between the political and media spheres (2010: 94). On the other hand, it is widely agreed that the ideological alignments have contributed to a highly politicised political journalism and to an increasing polarisation (Casero, 2012; González and Novo, 2012; Martínez Nicolás and Humanes, 2012; Van Dalen, De Vreese and Albaeck, 2012). The reasons for this situation seem to be two: the tensions between the media companies and the political parties produced by the successive license concessions granted to the audiovisual sector from the 1990s, and the subsidies given to the press in its different variants (advertising, grants). Secondly, the consolidation of interpretive journalism, reflected through the radio and television talk shows, in which journalists act as representatives of the ideological positions that coincide with those of the political parties. Large newspapers tend to act as political actors on major issues of political confrontation: by supporting or opposing the proposals of the political parties or the government, or through investigative journalism, by publishing cases of corruption and political scandals in general. In Spain the audiovisual sector was liberalised in the 1990s, although with a licensing system which has perfectly reflected the parallelism that was already known in the press. The relations between the media companies and the political parties and the regulatory institutions have entered into conflict when the government’s decisions have affected the broadcasting licenses and the economic interests of the media groups. Moreover, the government has promoted the consolidation of related media groups (González, Rodríguez, Castromil, 2010). On the other hand, in the management of public television, the exploitation attempts of the government have been a constant in political life. In general, the management of RTVE has been guided by the political interests and projects of the respective governments. The examination of TV audiences according to their vote preferences in the general elections of 2011 and their TV channel preferences to follow the political and electoral news shows that there is a clear relation between the preferred channel and the voted party (see table 1). We could affirm that there is a process of selective exposure, which is not as strong as in the case of press, but is definitively significant (Humanes, 2013). As in the North American context, in Spain there has been a battle to obtain more loyal niche audiences defined by their political ideology (Farias and Roses, 2009: 21). For instance, El País newspaper published in its TV criticism section: “Fighting for the same audience, and with the same weapons. Intereconomía and 13 TV are engaged in a fierce battle to conquer the most conservative and Catholic viewers (‘proud to be righties’ says one slogan)” (Guerra abierta en la ‘TDT party’, 20-3-2013). The paper also wrote: “La Sexta broke the audience records with [the TV shows] Salvados and El intermedio. This was affirmed by Planeta, the owner of Antena 3, when protecting the identity of this refuge between progressive and indignant in a DTT full of chat shows frayed with cat’s names" (Culebrón, 17-2, 2013). Source: Centro de Investigaciones Sociológicas, Estudio 2920. As pointed out by Hallin and Mancini (2004), one of the indicators of parallelism is the degree in which the media content reflects the different political orientations, which can be achieved through a system of internal or external pluralism. A system based on internal pluralism is that in which a media organisation does not show a defined political orientation but a diversity of points of view, and in which the professional role assumed by journalistic is more directed towards neutral information than towards interpretive journalism. In contrast, a system of external pluralism predominates in media systems with a strong political parallelism, like the Spanish case (Hallin and Mancini, 2004: 30). Along the same line, Kaid and Strömbäck (2006: 425-426) claim that “objective and impartial information is important in media systems that are governed by internal pluralism but not so much in media systems governed by external pluralism”. The second, third, fourth, fifth and sixth hypotheses of this study address the presence of these indicators of pluralism and parallelism in TV news programmes. As we have pointed out in a previous article (Humanes and Montero, 2013: 168-169), the content analyses aimed at measuring internal and external pluralism in our country have not measured these indicators, which makes this study more interesting as it can complement the previous works carried out by academics (Laporte and Sádaba, 2005) and the audiovisual councils of Catalonia and Andalusia. This article has two broad objectives. The first one is to determine whether the news content of the Spanish mainstream television channels is governed by external pluralism as a distinguishing feature of the polarised-pluralist media system, as previously explained. The second objective is to address the relation between pluralism and political parallelism in the way proposed by Hallin and Mancini (2004). H1: External pluralism will dominate over internal pluralism in the Spanish media’s agenda setting. H2: A unique point of view will predominate in the news, which is a distinctive feature of the systems characterised by external pluralism. H3: Interpretive journalism, which is a distinctive feature of the systems characterised by external pluralism, will predominate in the Spanish media. H4: The political agenda setting is characterised by external pluralism, so that each TV network will give more importance to certain subjects and will make other issues less visible according to its ideological orientation. H5: A unique point of view will predominate in the political news. H6: Interpretive journalism will predominate in political news, along with positive or negative assessments depending on the political orientation of each network towards the subjects closest to its editorial line, as proposed by the thesis of political parallelism. Source: Authors’ own creation. *Presentation assisted with video. The study aims to achieve its objectives and to test its hypotheses with the content analysis of a sample of 3,134 news items broadcast by the prime-time news programmes of six mainstream national television networks: TVE1, Antena 3, Telecinco, La Sexta, Cuatro and Intereconomía. For the analysis, we examine the news broadcast during three weeks randomly selected within the first quarter of 2012 (23-29 January, 13-19 February, and 5-11 March). The sports and the weather sections were not taken into account for the study. Table 2 presents the basic characteristics of the sample of news. Indicators related to the relevance of the news within the programme. The objective is to measure the importance granted to some issues in comparison to others, through three variables: length of the news report, inclusion (or not) and position in summaries, and order of appearance within the news programme. This part of the analysis is based on a purpose-built three-level index of importance (null, medium and high) based on the previous variables. Theme selection. Refers to the most important and second most important events of the news programme. These events were classified in thematic blocks (see table 4). The analysis of this variable also included establishing whether the news item was part of a thematic block about the same issue. The level of pluralism has been addressed through a variable that measures the presence/absence of different perspectives on the same news item. Indicators related to the journalistic style. It refers to the position of the journalist in relation to the action or the actor of the news story. This analysis has been divided in three categories: descriptive (narration of what happens), interpretive (analysis and assessment of the situation) and critical (which includes the opinion of the journalist) types of journalism (McNair, 2000; Strömbäck and Dimitrova, 2006). The news items with interpretive and critical styles have been coded according to their assessment (positive, negative or neutral) of the main issue (see table 8). Political orientation of the network. This variable has been measured with the ideological position, the memory of vote and proximity to a political party of the audience of each network, based on the data provided by the 2011 post-election study of the study 2920 carried out by the Centro de Investigaciones Sociológicas (“Centre for Sociological Studies”) on the use of newspapers, radio stations and television channels among Spanish people. Table 3 shows the results. Communication group to which it belongs. This indicator is interesting because the date on which the data were collected from Telecinco and Cuatro they were already part of the same media group and Antena 3 and La Sexta were in the merging process. Ownership: public/private. This variable serves to determine whether the news programmes of the private TV stations have greater tendency towards the commercialisation of news content and how this might affect pluralism. The results of the content analysis are organised according to the two general objectives of the study. The first level of analysis of the internal and external information pluralism should be based in the networks’ news programmes’ agenda setting (H1). The central hypothesis of the agenda setting says that there is a correlation between the issues highlighted by the media and the subjects regarded by citizens as the most important or worrying (in the case of the personal and/or public agenda). Following this argument, the plurality of the issues selected by every television channel will be necessary for the public to make a pluralistic perception of reality. Table 4 shows the thematic distribution of each TV network. In the presentation of results the 87 main events identified in the sample have been grouped into 14 thematic blocks. In all networks the political news constituted the greatest percentage of the news content, followed by economic news. There was also an important presence of issues related to the most commercial and/or sensational genres, such crime (10%) and disasters (10.7%). To corroborate the first hypothesis about the predominance of external over internal pluralism in the agenda setting, we carried out bivariate analysis and adjusted residuals analysis (adjusted residuals over ±1.96 indicate that there are more or less cases than we would expect under the null hypothesis, with a confidence level of 95%). This allowed us to determine whether there is over-representation (or underrepresentation) of certain issues at two levels: across the news programmes of the different networks (external pluralism) and within each network -internal pluralism-. In the event of the existence of external pluralism, the analyses should show differences between networks with respect to the distribution of topics, i.e. if all the networks give the same importance to the same topics then the residuals will be close to 0. The statistically significant residuals in table 4 confirm that Intereconomía has an overrepresentation of political, economic and employment news in comparison to the rest of the networks. Among private television networks, Telecinco largely conforms to the most commercial news model, which is centred in disasters, crime, society and social problems with an orientation towards human interest. The news programmes produced by Cuatro, also owned by Mediaset Spain, are similar to those of Telecinco, since both have greater overrepresentation of the most commercial news, accompanied by the under-representation of political news. Finally, the news programmes of the public network have greater presence of news about science, culture, and conflicts and wars, although this case is explained by the greater inclusion of international news. The differences in the networks’ agenda are also statistically significant when the 87 news events are considered separately (Χ2: 1248.391 gl:425 p≤ .000). The results also confirmed the second hypothesis about the preference for a unique point of view in news production over the inclusion of a plurality of views about a same event, for the whole sample. Only 37.2% of the news items offered more than one perspective. More interesting, however, is the residual analysis presented in table 5, which shows the existence of differences across networks. Only in TVE half of the news items present different perspectives. Antenna 3, Cuatro and La Sexta are above the average percentage of the total sample. But the networks that fit the hypothesis the most are Telecinco and Intereconomía. To reject the idea that different perspectives about a same event were offered in different news items (i.e. in two news items) we associated the variable “presence of different points of view” with the variable “inclusion in a thematic block”, i.e. inclusion in a block of several news pieces about a same event. The results reveal that the news stories that present more than one point of view are those that are grouped with others news stories into a thematic block, and that those that have only a single perspective are not part of any block. And this applies to the whole sample (p≤ .002) and to each network separately, with the exception of Cuatro (p≤ .063). This result reinforces the second hypothesis. The third hypothesis has been only partially confirmed for the total sample since almost half of the units of analysis are descriptive and the other half are interpretative and critical (table 6). Of all the networks, the public network is the only one that clearly conforms to descriptive journalism, while Intereconomía and La Sexta are the complete opposite. Informativos Telecinco has equal shares of descriptive and interpretive news, and Antena 3 and Cuatro concentrate the highest residuals in purely interpretative journalistic style. The variable “journalistic style” was associated with the variable “presence of several points of view” in order to achieve a more truthful explanation. Critical news items (+4.5) tend to include more different points of view than descriptive news (- 4.9) (Χ2: 223.073 gl: 2 p≤ .000). The relevance of this relation for political events will be addressed again later. The relation between pluralism and parallelism is more clearly reflected in the political news. The fourth hypothesis predicted that the selection and importance of the political affairs would follow the model of external pluralism, i.e. networks would give priority to certain topics and would make others less visible according to their ideological orientation. The results presented below only correspond to the events classified in the political block and those that were related to the economy or trade union and thus had an undeniable political component. In total the study considered the 18 events with the highest frequency. Table 7 presents, for each event, the negative and positive adjusted residuals that are statistically significant in each news programme. This analysis allows us to identify the topics that are over-represented (or under-represented) based on the number of news items dealing with them. In this way, if all the networks had allocated a similar number of news, the residuals would be less than ±1.96 and we would be talking of internal pluralism. The results of the content analysis allow us to reject this idea in 15 themes. Once again, Intereconomía is the network with the greatest differences in its informative priorities: the national public deficit; news about ETA and the peace process; the unions’ protests over the labour reform; the amendment of the abortion law; the anniversary of the 11-M; the congress of the Popular Party; the elections to the Executive Secretary of the PSOE; the ERE gate and other cases of corruption in the Junta de Andalucía; and the involvement of the former Minister José Blanco in the Campeón Case are the most over-represented topics. In contrast, TVE and Antena 3 only show positive residuals for one topic: the deficit of the autonomous communities and the labour reform, respectively. Informativos Telecinco also gives more visibility to the news about unemployment. La Sexta stands out for giving the largest coverage to the Nóos case (also known as the Babel Operation), in which Iñaki Urdangarín is involved. Finally, none of the issues gets positive significant residuals in Cuatro. There are also significant differences in relation to the issues with the lowest coverage in the news agenda of each programme. In the public network the Nóos case received the lowest news coverage. In Telecinco it was the unions’ protests over the approval of the labour reform and in Antena 3 the deficit of the autonomous communities. Noticias Cuatro dedicated less news items to the corruption cases of the Andalusian Government, the labour reform, the national deficit, ETA and the peace process; and the unions’ protests over the approval of the labour reform. La Sexta under-represented the events in which ETA was the protagonist, the congress of the PP, and the elections campaign in Andalusia. With regards to the importance given to the events, the differences in the associations are statistically significant (p≤ .000). But in general terms there is no correspondence between the number of news items and the level of importance. TVE1 gives a high level of importance (residuals +2.8) to the issue of the deficit of the autonomous communities –whose presence is greater than expected–, but it is the congress of the PP which receives the highest importance (+6.8). 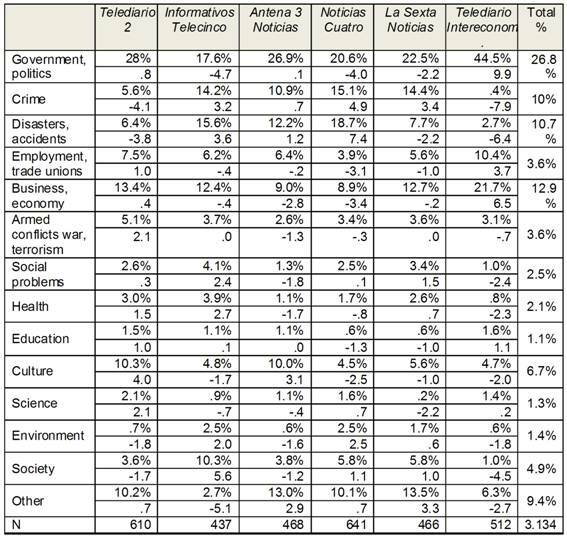 In the case of Telecinco, the issues with a high level of importance are the labour reform (+ 3.5), the congress of the PP (+ 6.6) and the trial against Valencia’s former president Francisco Camps (+4.8). In Antena 3, the labour reform does receive a high level of importance (+3.5), but the issues that receive the greatest importance are the PP’s congress (+8.4), like in the public network, and the unions’ protests over the labour reform (+5.1). 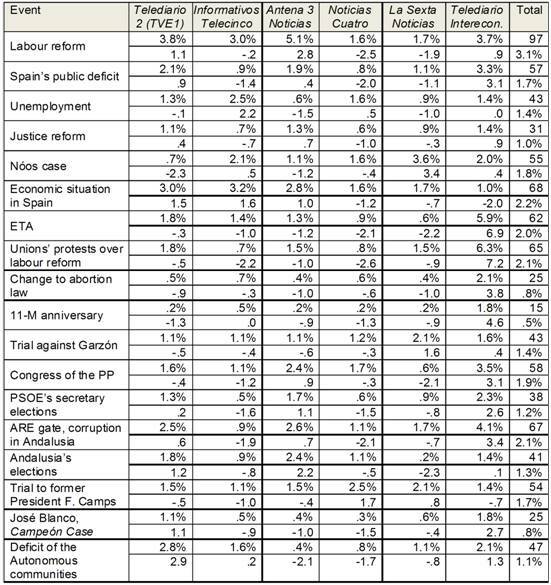 Cuatro presents the trial against Camps as the most important issue (+7.9), which is also the most covered issue (2.7%, see table 7). In La Sexta Noticias the Nóos case is the most covered, but the issues presented as the most important are the protests over the labour reform (+5.6) and the trial against Camps (+3.1). In Intereconomía the quantitative coverage is related with the importance given to the topics: the unions’ protests over the labour reform (7.9), the amendments to the abortion law (+7.6), the 11-M anniversary (+6.7), the PP’s congress (+3.2). The fifth hypothesis predicted that a unique point of view would predominate in the coverage of the topics closest to the orientation of the network, particularly in privately-owned networks. The results are not statistically significant for Antenna 3 and Cuatro and for this reason we will focus on the associations that exist in the other four networks. In Telediario 2 (p≤ .013) it should be noted that although in political issues the use of different points of view is predominant (53% of the news), the three issues most directly related to the actions of the government (labour reform, justice reform and the protests over the labour reform) are mostly presented with a unique point of view. In Telecinco only 35% of the news items present diverse opinions, and in terms of events only the announcement of the amendment to the abortion law moves away from this trend (+2.4). In La Sexta (p≤. 008) there is a higher proportion of news with different perspectives (46.7%; + 1.8), but this trend is not followed for the trial of Camps (-2.8) or the unions’ protests over the labour reform (-2.1). In Intereconomía (p≤. 000) the analysis confirmed the tendency to use of a unique "point of view" in the coverage of political news (-7.3), with the exception of the news about the amendment of the abortion law (+2.7). The last hypothesis is that the interpretive journalistic style will prevail in political news, along with positive or negative evaluations depending on the orientation of the TV network. Intereconomía (p≤ .000; p≤ .000) fits perfectly this model. The issues that are closest to its ideological orientation (the anniversary of the 11-M attacks; the trial against Camps, which resulted in his acquittal; and the amendment to the abortion law) mostly conform to the interpretive or critical style and are always accompanied by positive assessments. The issues that do not support its ideological positions (the Nóos case, ETA, the unions’ protests, the trial against Garzón, the ERE gate in Andalusia, and the Campeón case) are also presented with an interpretive journalistic style, but in this case the evaluation of their themes and/or protagonists is negative. In La Sexta (p≤ .005; p≤ .000) the same model is used. The labour reform, the economic situation in Spain, the amendment of the abortion law, and the trial against Garzón are negatively assessed. In Cuatro (p≤ .000; p≤ .000) and Antena 3 (p≤ .000; p≤ .000) none of the events associate the interpretive style with positive or negative evaluations. In Telecinco (p≤ .027; p≤ .000) the events that generate more news items with interpretive style and negative evaluations are the deficit of the autonomous communities, the unemployment and the Nóos case; while only the PP’s congress received positive assessments. As expected, in the news programmes of the public TV networks (p≤ .000; p≤ .000) the data refute the sixth hypothesis according to the regulation of these programmes. As shown in table 8, the descriptive style is predominant (68%) and when the interpretive style is used it does not generate positive or negative evaluations for any of the selected events. The results show that, with regards to pluralism, the Spanish television model is hybrid and combines different levels of internal and external pluralism according to the profile of the network and the business strategy of the media group. The predominance of one or another type of pluralism cannot be confirmed. Possibly, one of the important factors to keep in mind is that, after the implementation of DTT, the television sector are currently developing and adapting their supply according to the demand and that the networks are trying to delimit their news programmes to optimise the audiences. In the classification of the television networks, according to the primacy of internal or external pluralism, there is not a single dimension. The type of pluralism that characterises a TV network is defined by three important areas: the production of news based on balance and neutrality criteria; the commercialisation of information and the emphasis on entertainment; and the ideological position taken in the news to defend political and social values. The poles corresponding to these three areas are represented, respectively, by TVE1, Telecinco and Intereconomía. The private networks that more clearly follow the business model (Telecinco, Cuatro and Antena 3) are still governed by the traditional logic of the search for mass audiences in the sense proposed by Mancini (2013), while La Sexta and Intereconomía are closer to the new logic of the search for ideologically-oriented niche audiences. There is no strong political parallelism between television and the political system, since in general terms there is no predominance of external pluralism. The selection of topics, the presence of a unique point of view in the news content and the positive or negative valuation of the information, according to the ideological orientation of the network, do not present a positive correlation in most networks, with the exception of Intereconomía, and to a lesser extent, La Sexta. This is not an obstacle for news programmes to take one or another position in the most important political issues, through the selection of topics, their treatment and assessment. It should be noted that, contrary to the expected presence of a strong state control in public broadcasting, which is characteristic of the polarised pluralistic system, the content analysis showed that TVE1 is the network with the highest level of internal pluralism. The results seem to confirm that the policy and the management models of the public audiovisual media have remarkable effects on pluralism (Fernández and Fernández-Viso, 2012). * This article is part of an ongoing research study carried out as part of a wider research project titled Implantación de la TDT en España e impacto sobre el pluralismo (“Implementation of DTT in Spain and the impact on pluralism”), which is funded by the Spanish Ministry of Science and Innovation (ref. CS2010-17898/COMU). Start date: 2010. End date: 2013. J Blumler, M Gurevitch (1995): “Towards a comparative framework for political communication research”. In JBlumler, MGurevitch (Eds. ), The crisis of public Communication. London: Routledge. Pp. 59-72. (Original work published in 1975). E Bustamante, P Corredor (2012): “La segunda legislatura (2008-2011). Balance audiovisual del gobierno de Rodríguez Zapatero”. Ámbitos, 21-A, pp. 297-314. A Casero (2012): “El periodismo político en España: algunas características definitorias”. In A Casero (Ed. ), Periodismo político en España: concepciones, tensiones y elecciones. La Laguna: Cuadernos Artesanos de Latina, 33. Pp. 19-45. A Czepek, U Klinger (2010): “Media Pluralism Between Market Mechanisms and Control: The German Divide”. International Journal of Communication, 4, pp. 820–843. P Farias, S Roses (2009): “La crisis acelera el cambio del negocio informativo”. Estudios sobre el mensaje periodístico 15, pp. 15-32. I Fernández-Alonso, A Fernández-Viso (2012): “Internal pluralism in the governance of public service broadcasters in Spain and the role of social groups and professionals. The case of RTVE”. Comunicación y Sociedad, Vol. XXV (2), pp. 203-230. JJ González, R Rodríguez, A Castromil (2010): “A Case of Polarized pluralism in a Mediterranean country. The Media and Politics in Spain”. Global Media Journal: Mediterranean Edition, 5 (1/2). D Hallin, P Mancini (2004): Comparing media systems: Three models of media and politics. Cambridge: Cambridge University Press. D Hopmann, C de Vreese, E Albæk (2011): “Incumbency Bonus in Election News Coverage Explained: The Logics of political power and the Media Market”. Journal of Communication, 61, pp. 264-282. ML Humanes (2013): “Exposición selectiva a la información política y partidismo de las audiencias en España”. In M Vicente Mariño, T González Hortigüela, M Pacheco Rueda (Coord. ), Investigar la Comunicación hoy. Revisión de políticas científicas y aportaciones metodológicas: Simposio Internacional sobre Política Científica en Comunicación, Vol. 2. pp. 299-300. ML Humanes, MD Montero (2013): “La calidad del pluralismo interno en la TDT”, in JL Gómez Mompart, JF Gutiérrez Lozano, D Palau (eds), La calidad periodística. Teorías, investigaciones y sugerencias profesionales. Valencia: Universitat de València. Pp. 163-175. B Josephi (2005): “Journalism in the Global Age Between Normative and Empirical”. Gazette, 67(6), pp. 575-590. Kaid (ed), The handbook of election news coverage around the world. London: Routledge. Pp. 421-432. MT La Porte, T Sádaba (2005): “Hacia un nuevo pluralismo en la televisión europea”. Doxa Comunicación, 3, pp. 143-160. P Mancini (2013): “Media Fragmentation, Party System, and Democracy”. The International Journal of Press/Politics, 18 (1): 43-60. M Martínez Nicolás, ML Humanes (2012): “Culturas profesionales del periodismo político en España. El discurso de los periodistas sobre la política y las funciones políticas de los medios”. In A Casero (Ed), Periodismo político en España: concepciones, tensiones y elecciones. La Laguna: Cuadernos Artesanos de Latina, 33. Pp. 47.66. G Mazolleni (2010): La comunicación política. Madrid: Anaya. B McNair (2000): Journalism and democracy. London: Routledge. C Seymour-Ure (1974): The political impact of mass media. London: Constable. J Strömback, O Luengo (2008): “Polarized Pluralist and Democratic Corporatist Models: A comparison of Election News Coverage in Spain and Sweden”. In International Communication Gazette, 70(6), pp. 547-562. J Strömback, DV Dimitrova (2006): “Political and Media Systems Matter. A Comparison of Election News Coverage in Sweden and the United States”. The Harvard International Journal of Press/Politics, 11(4), pp. 131-147. A van Dalen (2012): “Structural Bias in Cross-National Perspective How Political Systems and Journalism Cultures Influence Government Dominance in the News”. The International Journal of Press/Politics, 17(1), pp. 32-55. A van Dalen, C de Vreese, E Albaeck (2012): “Different roles, different content? A four-country comparison of the role conceptions and reporting style of political journalists”. Journalism, 13 (7), pp. 903-922. R Zallo (2010): “Política de Comunicación Audiovisual del gobierno socialista (2004-2009): un giro neoliberal”. Revista Latina de Comunicación Social, 65, pp. 14-29. Article received on 20 July 2013. Submitted to pre-review on 22 July. Sent to reviewers on 24 July. Accepted on 14 September 2013. Galley proofs made available to the authoress on 19 September 2013. Approved by authoress on: 20 September 2013. Published on 21 September 2013.